Components Themed 3 Level Rocket Tube Crawl, 3 Lane Wave Slide, Themed Rocket Climb, Sphere Climb, Fun Ball Battle, Themed Space Pirate Ship, 3 Level Tube Step Climb, 4 Lane Speed Slide, Ball Jam Rooms, Happy Ball Pool, Trampoline. 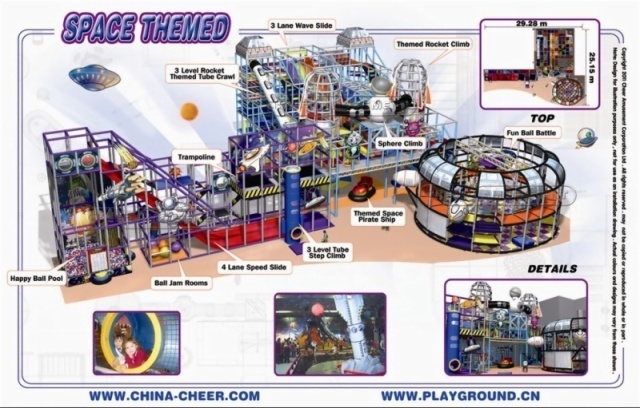 This is a space themed indoor amusement parks, amusement project is very rich, mainly by the Themed 3 Level Rocket Tube Crawl, 3 Lane Wave Slide, Themed Rocket Climb, Sphere Climb, Fun Ball Battle, Themed Space Pirate Ship, 3 Level Tube Step Climb, 4 Lane Speed Slide, Ball Jam Rooms, Happy Ball Pool, Trampoline. This large but open design is ideal for any business looking to set up a facility. Themed Rocket and Space Pirate Ship arouse an eager want in the children and will definitely make them have fun playing in the space themed playground. Children can climb, slide, squeeze and navigate their way around this colorful and safe playground while mom or dad sit back and relax for a few hours. This type of space themed indoor playground can be installed in many places, such as Birthday Party Centers, Entertainment Centers, Cinemas and so much more.